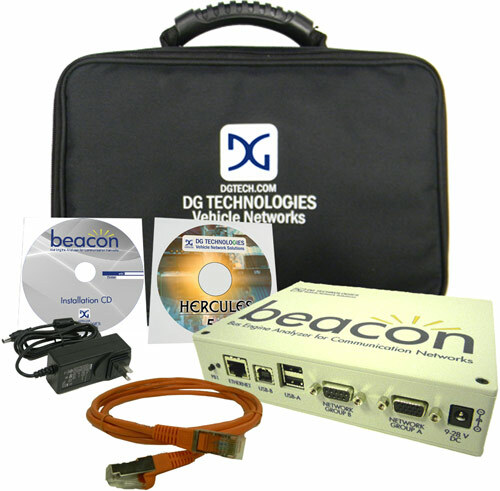 DG Technologies’ Beacon is a tool for vehicle network design and development activities. The network development device offers simultaneous access to multiple protocols including CAN FD. With six CAN or CAN FD and two LIN channels, possible applications of the tool include EOL testing, ECU prototyping, data logging, bus analysis, simulation, and validation. One channel has a fault-tolerant CAN option and one single-wire. Wifi is enabled via a USB dongle. A 100 Mbit/s-Ethernet and a USB connection are also included. Three interchangeable protocol card expansion slots offer further connectivity. Benefits of the tool include the simultaneous support of multiple protocols and hardware simulation and software validation. The tool has extensive data logging capability, as well as diagnostic and reprogramming capability. Multiple PC based applications interface with the Beacon simultaneously and it is compatible with Android apps and others. As PC software, the analysis software Hercules and the data logging software Gryphon Logger Config are included. The tool is compatible with Busmaster, Matlab, Labview, and others. DG Technologies specializes in the design and development of intelligent software and hardware protocol interface devices for the in-vehicle and controller area network markets. The company, which is part of the Dearborn Group, is located in the US.